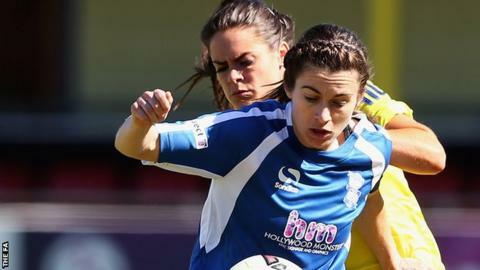 Forward Karen Carney's return from injury has lifted spirits of winless Women's Super League side Birmingham City, says defender Kerys Harrop. Carney, 27, who was the top-flight's leading scorer in 2014, made her first appearance this term as a substitute in Sunday's 1-0 home loss to Chelsea. Birmingham are second-from-bottom with just two points from four games. "It's a massive confidence boost - Caz is a massive player in the team," England defender Harrop told BBC Sport. Carney's return to action is a timely one with England manager Mark Sampson set to name his World Cup squad on 11 May. She was one of two Birmingham City players named in the PFA's WSL Team of the Year on Sunday - Jo Potter the other. Birmingham City, who were top at the mid-season break in 2014, are second-from-bottom with just two points this term. Their only win in any competition this season came against Liverpool in the fifth round of the FA Cup. For a Blues side that has collected just two points from four league games, Carney's return, coupled Kirsty Linnett's own injury comeback and Freda Ayisi's availability after a three-match ban, has eased pressure on David Parker's depleted Blues squad. "It gives everyone a lift - it gave the crowd a lift when they saw her (Carney) coming on," said manager Parker. "I don't think they were quite expecting it so early. "When we start to get the players back in now, a little bit more and more, it gives us more different options and more variety to try to do different ways to try to win a game of football." Birmingham next face Bristol Academy, the only other winless side in WSL 1, on Wednesday.